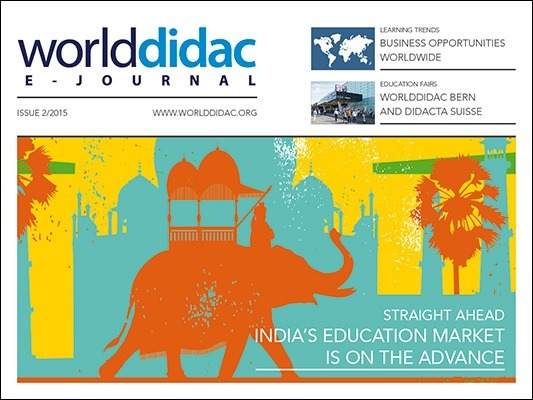 New Issue of Worlddidac e-Journal [The Potential of India’s Education Market] is Now Available Online! Home IDA New Issue of Worlddidac e-Journal [The Potential of India’s Education Market] is Now Available Online! The new issue of Worlddidac e-journal – the digital magazine for the international education industry – is now available for free. This year´s second edition is all about the potential of India’s education market, new education possibilities in the wake of digital technology and recent news from the international education supply sector. Furthermore, the magazine reports on both promising business opportunities and current events in the world of learning like important upcoming trade fairs. Due to the Worlddidac India taking place in September, particular attention is payed to the Indian education market. Twice a year the Worlddidac e-journal presents the global education trends and key topics in education worldwide. It is primarily aimed at dealers and distributors of education supplies as well as visitors of the international trade fairs of the Worlddidac Association. The free app is available in the Apple App Store and the Google Play Store. You can find the web version of the e-journal on: www.worlddidac.org. The new issue will be the magazine’s fifth. The first issue of Worlddidac e-journal went online in fall 2013, others followed in 2014 and 2015. Worlddidac e-journal’s chief editor is the renowned educationalist Prof. Dr. mult. Wassilios E. Fthenakis. The Munich AVR agency is responsible for the editorial and technical implementation of the publication.